No matter what type of birth you’re planning (and hoping) for, you shouldn’t rule out the possibility of a Cesarean section. At OCWMG our ideal outcome is to always have a vaginal delivery, however, there are times when it becomes clear that this could be risky for mom’s or baby’s health and a C-section becomes medically necessary during labor. Not all C-sections come as a surprise. In many cases, your doctor may schedule you for a C-section in advance because of known factors or complications that would make a vaginal delivery too difficult. 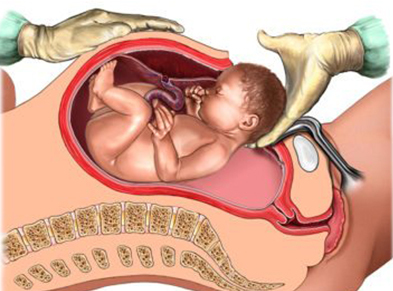 A c-section or cesarean birth is the delivery of the baby through an abdominal and uterine incision. There’s no need to be asleep or put under general anesthesia for a C-section. A regional anesthetic such as epidural or spinal block will numb the lower half of the body from the waist down. This is the preferred method of anesthesia for C-section. For these methods, anesthesia is injected into the space surrounding your spinal cord, numbing you from that point down. You will be awake the whole time so you can see your baby right away! You may feel a pressure sensation in the abdomen, but you should not feel pain during the procedure. Recovery time is a little different versus a vaginal delivery. Typically women stay in the hospital three to four days after C-section delivery compared to two days after a vaginal delivery. Recovery after a c-section may take a couple of extra weeks. Yes, you will end up with a scar, but there are a few tips to help it heal well. The incision is usually made two finger-widths above the pubic bone in your lower abdomen and is usually a transverse, or horizontal line. 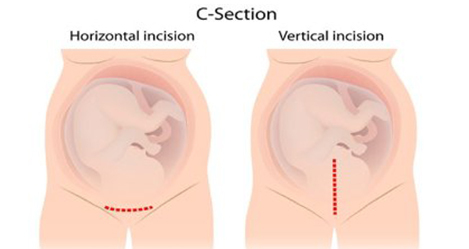 Your baby will be delivered through the incision. New techniques in suturing make it so that your doctor can sew you back up with as minimal scarring as possible. Make sure to keep the incision clean during the healing period to prevent infection. Avoid heavy lifting or housework to help minimize scarring. You may also consider topical medications to help minimize scar, including a serum from Stratpharma called Stratamed. Just because you had a prior C-section with one child doesn’t mean you have to have one with every delivery. At OCWMG we encourage VBAC, vaginal birth after cesarean if your physician feels that you will be a good candidate. This will depend on review of why cesarean delivery was needed with the first pregnancy. Having a C-section delivery is just as big of an accomplishment as a vaginal delivery. It’s important to know having a C-section doesn’t make patients less of a mother than someone who gave birth vaginally. Certain circumstances may be completely uncontrollable for a woman and may necessitate a C-section, or some women prefer to deliver via C-section. Regardless of the method of delivery, both mothers carried the baby as best as they could and will equally provide love and care for their baby to the best of their abilities. You will be scheduled for your post operation exam 2 weeks from the delivery date. At this appointment your physician will check your incision to make sure its healing properly. If you are experiencing: High or persistent fever above 101*F, abnormal wound discharge, worsening or persistent pain, or excessive vaginal bleeding then please call the office right away. Good Luck On Your Big day!